In what was perhaps the least exhilarating of all games so far in the 2018 edition of the FIFA World Cup that blew us away with its first 3 days' action, Serbia edged past Costa Rica thanks to an exquisite freekick by Aleksandar Kolarov. Costa Rica could not muster anything of note going forward and the scoreline which reads Costa Rica 0-1 Serbia is perhaps a bit flattering as far as they are concerned. 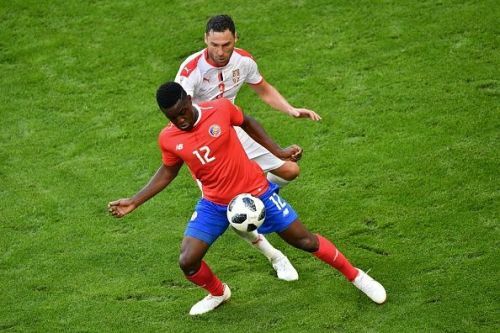 VAR inevitably came into play towards the fag end of the game as Matic got into an argy-bargy with Costa Rica's coaching staff over a ball that went out of play. Though the United man was reprieved, Prijovic would later get a yellow card after VAR was used to adjudge an incursion from his part yellow card worthy. At the end of the day, the Serbs walk away with a very valuable win and let's take a look at the 3 things they got right in their 1-0 win over Costa Rica. Serbia deployed the combo of Milenkovic and Tosic in central defence flanked by Kolarov and Ivanovic. Branislav Ivanovic, the former Chelsea man, proved to be too tough to negotiate with for the likes of Calvo and Venegas. Meanwhile, the young Milenkovic and the veteran Tosic, after a shaky start, ensured that Urena was not afforded enough space or time on the ball to create trouble. The defensive midfield duo of Milivojevic and Matic helped out to great effect and nullified the threat of Bryan Ruiz through the centre. They used their superior physicality to see off the danger in the final 10 minutes as Costa Rica tried putting in crosses incessantly. They were so solid at the back that Costa Ricans spent very little time in the box. If they can keep this up, Serbia will prove to be a tough cookie to crack for as long as they survive in the tournament.